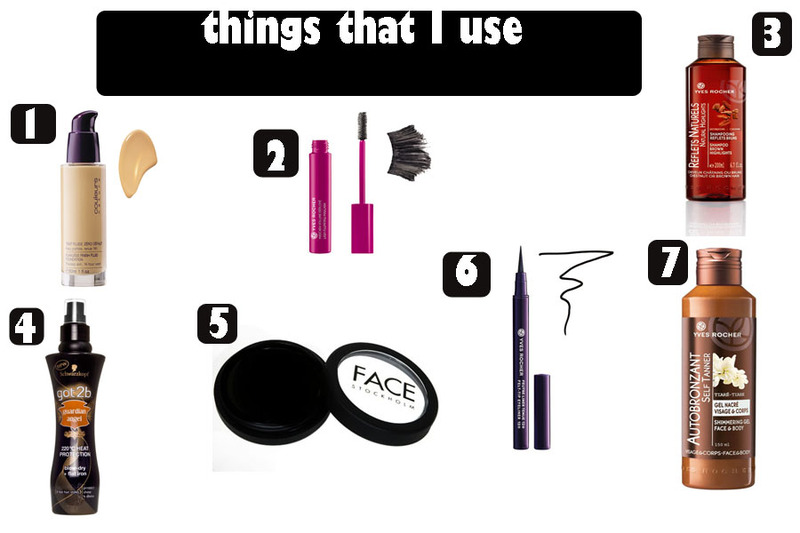 Well, these are the things that I use. I ordered some things from www.yves-rocher.se, I always order my make up, body lotions and beauty stuff from that page. Number 1, 2, 6, 7 and 3 is from yves rocher. 1. It is a foundation from YR, it stays up to 14h and I got the beige color, they have a lots of chades close to your own skincolor so it is good if you are in a hunt for one real good foundation. 2. It is a mascara from YR. It is not waterproof because I dont want to have it but you can choose if you like to have it or not. It is kinda good, not the best one that I had but it works. It got a round plastic brush, wich is good for those who want it. 3. It is schampo for brown hair. I tried it so it is good. The bad thing with YR they didnt have any conditioner for brown hair so I have to buy one in the store soon. 4. This product guardian angel is really great for those who flat iron their hair and need to have something to protect it! This product can protect your hair from heat up to 220 degrees. It is like soo good, I bought my second bottle and it last pretty long. 5. I use this black eyeshadow from Face Stockholm. It was expensive but it was so worth it. I use this one almost all the time and I bought it for over a year ago and I got almost the whole thing left! 6. This is an eyeliner from YR. It lasts up to 12 h and it is good and easy to apply. Most eyeliners are hard to get a straight line with but this one is so easy, it is like a pencil almost, I recommend it to everyone that wants a long lasting eyeliner. 7. Last but not least, this is a self taner from YR. Most products like this are not so good but this one really was good. It smells good, it gives a nice tan and it got this shimmering look and it smells awesome. It looks natural but the bad thing is it feels really sticky when you got it on your skin.. But is doesn't stick to your close so much, if you wash your clothes it disappears and it is easy to wash it off.